Just 5 minutes’ drive from the centre of Port Macquarie, this motel offers modern accommodation with free broadband internet access. Facilities include an on-site restaurant and outdoor swimming pool. Each suite is air-conditioned and includes cable TV, a minibar and a bathroom with hairdryer. LCD TVs are provided in all rooms. Most rooms have their own private balcony or courtyard. Governors Restaurant offers an à la carte menu of modern Australian cuisine for dinner and breakfast. Guests have access to a BBQ area, spa pool and guest laundry. Conference facilities are available. 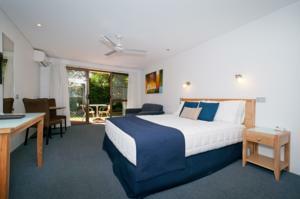 Port Macquarie Airport is a 5-minute drive from Best Western Macquarie Barracks Motor Inn. It is a 10-minute drive to Port Macquarie Golf Club. Rooms: Hotel Rooms: 34, Hotel Chain: Best Western. One child under 2 years is charged AUD 15 per person per night in a baby beds. One older child or adult is charged AUD 15 per person per night when using existing beds. There is no capacity for extra beds in the room. The maximum number of baby beds in a room is 1. Any type of extra bed or crib is upon request and needs to be confirmed by management. Supplements are not calculated automatically in the total costs and will have to be paid for separately when checking out.